We have a long-honoured morning routine which usually deals with this. I croak: “Chance of a cuppa?” into the early morning ether. You know, just throwing out my own tiny element of chaos into the maelstrom to see if my flap of a butterflies wings will have an effect on the other side of the bed. And somewhere under the duvet, from the depths of an emergent doze, an automatic answer pings back: “The chances are high”. We’ve been saying this every morning since Maddie came home from hospital at six days old. In those heady days, my husband had just watched real live childbirth with me at its centre and the memory was still fresh. Had I asked for the moon, he would have been on to NASA to book a seat. Tea, he could do. An unspoken understanding developed between us. This puzzling entity named Newborn had us both in a bewildered daze. But every now and then Phil was allowed to run away to a news reading studio, while I was left holding the baby. Tea was his way of equipping me for the day ahead, a warming welcome after about two minutes’ sleep. The situation did not get easier for the next five to six years. Through the broken nights, the 5:30am starts, the long dark teatime of the soul, my husband always had an affirmative response to my first parched words of the day. Now the children are later sleepers and life has, if temporarily, become easier. I work hard during the day, but not with the same insane half-asleep IQ-plummeting monotony as I once did. I can even sit at the keyboard and type without someone helpfully serving spoonful of ice cream onto it. But morning after morning, familiarity and habit step in to afford me this one luxury: a cup of tea made by my husband, who is actually very good at it. As he tells me with mock pomposity: “I was taught the art of teamaking by the Teamasters of Java and Sumatra.” Total poppycock, but great tea. This morning, though, the pingback did not happen. For the first time in ten years, the butterflies flap failed to elicit a response. Instead, there was a sort of gutteral intake of breath, a prolonged snort, if you will. The rest was silence. And, in the best tradition of downtrodden wives everywhere, I felt betrayed. I am your cook, your wife, your shortbread-maker…. The tiny angel on my shoulder stepped in with a few well chosen words. Poor mite, it said, cleverly using my mothering instincts to foster a feeling of pastoral protectiveness for the unshaven rumbling one. He’s exhausted. He did his ankle in on Friday playing football (grammar not taught in the heavenly heights then) and his immune system is on overdrive. Have a heart, the angel added. Shut up, I retorted after a few contemplative moments. And I concluded there was no point waiting. And I went and made four drinks: tea for Phil and I, and cocoa for the children. And I brought it upstairs, and I put it on the side, and the snoring continued. 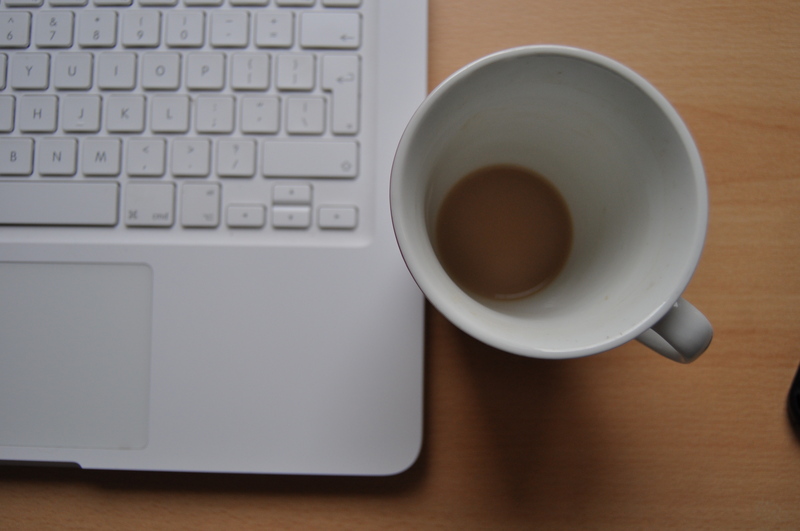 I sipped my own tea as I began this blog. When no-one else will listen those little white keys are always there for you. Sometimes these things just write themselves. My fingers flew back and forth over the keyboard, and before I knew it my tea was gone. I stared at the bottom of the cup, bereft. Where had it gone? I didn’t remember drinking it. But gone it was, just a fond memory. It was then that a small, petty revenge began to form in my head. I eyed my husbands cup of tea, still steaming on the bedroom sideboard next to the telly. As I conclude today’s offering, I am staring at the bottom of his teacup. This gave me several laugh-out-loud moments, and another flood of memories. Poor Phil and his missed tea, which would have done not one thing for his ankle anyway. Thanks Liz- always look forward to your visits. Funny how tea brings out the worst in one. Very petty….says more about me than him…. Wonderful reading, Kate. I always said you should write! I can’t say I’ve EVER heard that analogy, but you can count on me to perpetuate it. I’ll bring it back to New England, I’ll bring it back to school, and I’ll bring it back in style. Mhmm! Your cup of tea has put me in the mood for a serving myself, but being locked up in a hotel room in Arkansas, I do not expect to find my beloved PG tips here there or anywhere. Only deep fried food, catfish, and apparently watermelons? I wish you a fabulous tea very soon….although catfish and watermelons sound exotic beyond my wildest dreams….It’s a great blog Andrew, and I’ll be back for my next serving soon….